I think the flowers in question might be Mums! (Chrysanthemum) Not sure on the variety, though. Also, if you think your room is lacking inspiration then I should really make a post about MY room. It's seriously nothing more than a bed, dresser and desk that's perpetually covered in clothing, plus a radiator for added awkwardness! I'd kill to sleep in a room with this much amazing light, and pretty flowers to boot! How picturesque! It's totally not cluttered -- it kind of looks like an Anthro catalog! I love those flowers but have no clue what they're called. I've tried to have flowers so many times, but I have the worst green thumb. I killed my orchids in 1 month -- how is that even possible? Sigh. what camera and lens do you use? those photos are amazing. Alice I found you via a link at http://cindyloughridgephotography.com/ I'm glad I did you I have enjoyed trawling through your previous posts. Your style is certainly unique and engaging, I'm guessing given the number of pics of restaurants and coffee bars you have a fondness for food, you are a kindred spirit. I shall definitely pop back. your room looks lovely....your flowers & light are certainly beautiful...I'd say the orange ones are chrysanthemums - you guys call them 'mums' I think? And what is the desk with small shits of paper for?looks interesting. that bottom left photo is simply gorgeous. i ADORE every detail. Found the metal can, very good. I love how many flowers you have! My room is too small and cluttered, and I don't have the opportunity to change any of the furniture or paint or anything. But this is definitely a great inspiration! These photos are divine! I just love the mood and the colours. 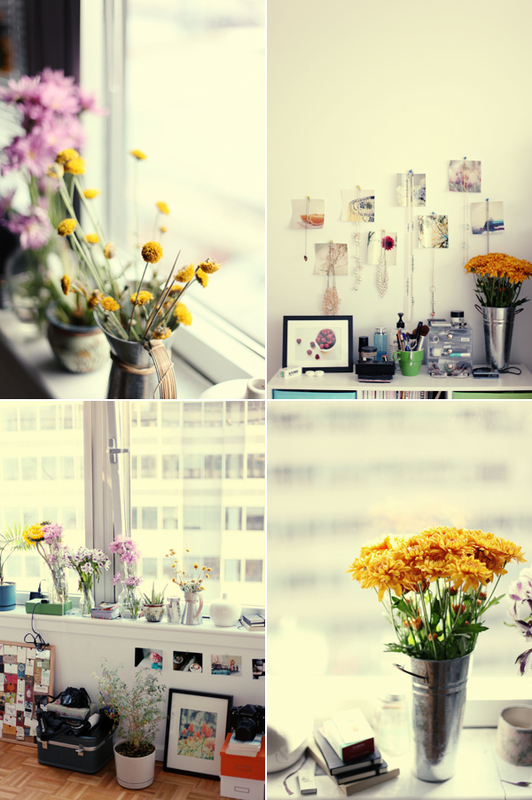 I love the light in your room and the arrangement with flowers, photos and all the little things. I hope you won't mind me using the flowers in a drawing. i love your room! you've got a nice touch when it comes to decorating.